Helen congratulates Jessie on her pregnancy and brings her up to date on Mary’s health. The news your mother has told me this afternoon is so beautiful and thrilling that I haven't been able to think of anything else! To think of a dear little soft wobbly, precious baby being on its way to this family is so wonderful that I can hardly believe I'm not just dreaming about it. There is only one thing that will can excite me more than I'm excited now and that is seeing Mary's joy over the news. And she will soon be well enough to be told; for she is getting along quite marvellously well—better than Dr. Grayson expected. Of course Cousin Lucy will be excited too, but then she gets excited more easily than either Mary or I. Just aren't we three spinster aunts going to have the time of our lives sewing for that baby this summer! Oh honey, aren't you wonderful to be giving so many people blissful happiness! I don't know of anything else that would have made up for the awfulness of this past spring and summer. As I said, Mary is doing wonderfully well. She hasn't been nauseated at all and slept four hours last night. Cousin Lucy is up at the hospital to-day. She meant to stay there last night, but Dr. Grayson persuaded her to come home. It seems too wonderful that everything should go as smoothly as it has; for as I told you, the operation was a long one, and the need for it great. Well, I must mail this so you'll surely get itto-morrow. Brown just came up for something and I could scarcely refrain from telling him that next winter he'll see a dear little red-headed baby (for of course it must have red hair!) visiting us in the W.H. 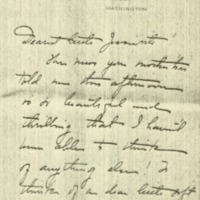 Bones, Helen Woodrow, “Helen Woodrow Bones to Jessie Woodrow Wilson Sayre,” 1914 July 10, WWP17492, Jessie Wilson Sayre Correspondence, Woodrow Wilson Presidential Library & Museum, Staunton, Virginia.